Been meaning to post about this novel I’ve been reading on and off. The author is contactable via the office of the Royal Palace. 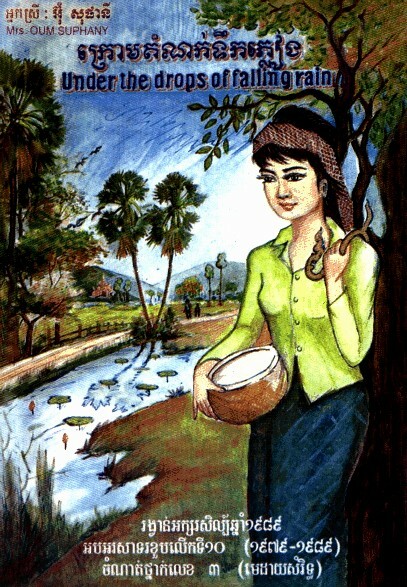 This novel was published in Khmer in 1989, translated into English in 1997. Structurally a romance regarding an arranged marriage during Khmer Rouge time, what’s particulary interesting is its discussion of culture. In this book, the KR destruction of culture is a crime just as horrible as what it does to people. Highly critical of the Khmer Rouge but positive toward the PRK government of the time. PRK era songs are mixed with discussion of George Sand’s works and Apsara dancing. An intriguing period piece.